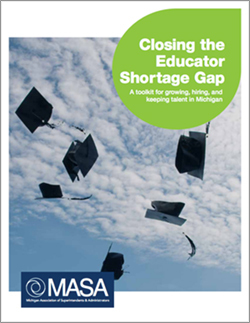 As districts across Michigan continue to struggle with teacher shortages, MASA’s Educator Shortage Workgroup (ESW) pressed forward with developing member-driven solutions. 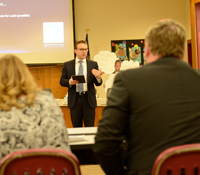 Front and center during the recent meeting of the group was the continuing work of gaining a better understanding of the nature of the qualified teacher shortages that districts are facing. Facilitated by Karen McPhee, session participants reviewed the purpose and scope of the work, examined proposed elements of a short-term toolkit, and covered an overview of development work on a long-term strategic plan. They also heard from MASA associate executive director for government relations Peter Spadafore about current legislation and participated in an interactive dialogue with MDE’s Educator Excellence Director Leah Breen. MDE’s Educator Excellence Director Leah Breen shares with ESW members the work that is ongoing to address the educator shortage at the MDE. Chris Wigent, MASA executive director, opened the session by stressing the essential nature of investing in this very important conversation with MDE and other organizations about district perceptions surrounding the statewide educator shortage. “We know the very important role that MDE will play in this work, and it is important that we hear from them, and they hear from you,” Wigent said. Further, the purpose and scope of the ESW work is to identify, evaluate and prioritize strategies that will grow, attract, and retain quality candidates to the educator pool. 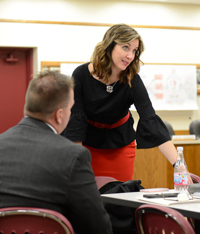 To this purpose, Breen gave the workgroup an overview of MDE’s thinking and philosophy surrounding teacher certification, where the department offers flexibility surrounding teacher placement, and answered members’ questions and concerns. Peter Spadafore covers pending legislation that could impact the educator shortage that districts may be experiencing. Spadafore covered pending legislation dealing with teacher pay, teacher college debt, and teacher preparation, and emphasized the importance of being engaged in the legislative process with member representatives as these packages are considered. The ESW’s work continues to progress forward with the release of the short-term toolkit, the continuing work on a long-term strategic plan, as well as looking to form additional, focused workgroups targeting specific areas such as legislative, promotion of the profession or higher education involvement. Article by Mitch Smith, MASA communications specialist. You can contact him at mitchsmith@gomasa.org or 517-327-9244. Karen McPhee shares with the ESW the historical timeline of how Michigan arrived in the current condition where many districts are experiencing a shortage of qualified educators. The ESW is extremely action oriented and is aggressively moving forward to address the critical issue of teacher shortages. To that end, we are providing you with a link to the “Educator Shortage Toolkit.” This resource is a collection of current options and promising strategies from around the state and nation.